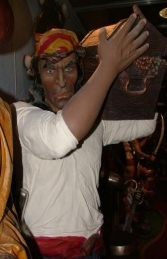 This life-size replica Skeleton Pirate Model stands at 6ft tall, he is the ultimate scarey pirate figure. 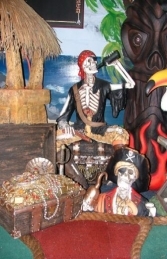 He is ideal for any Pirates of the Carribean style themed area with our other Skeleton Pirate figures and busts. 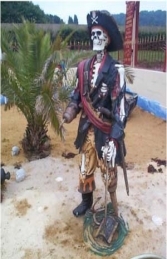 This fantastic life-size Skeleton Pirate figure is ideal for a Treasure Island, Davy Jones' Locker or Carribean Pirate theme. He is full of gory detail, his clothes hang in bloody rags, his wooden-leg, skull and cross bone add to the menacing look of his fearsome metal sword and deadly hook. 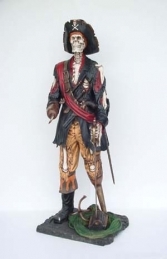 This Skeleton Pirate model is also available in a 3ft version JR 2309.